IR up-conversion phosphors are particles that convert infrared light into visible light. Normally, materials that fluoresce are down conversion particles that absorb energy at a higher level (ultraviolet) and emit energy at a lower level (visible). For example, typical ultraviolet lights will cause a visible fluorescence which is a shift down in photon energy levels. Up-conversion materials are a very rare class of inorganic crystals that can absorb multiple photons at a lower energy level and emit one photon at a higher energy level. The up-conversion process is also called an Anti-Stokes shift. The IRUCG, IRUCB and IRUCR are direct converting phosphors that do not need to be charged with energy prior. The IRSPG needs to be charged with light prior to use. 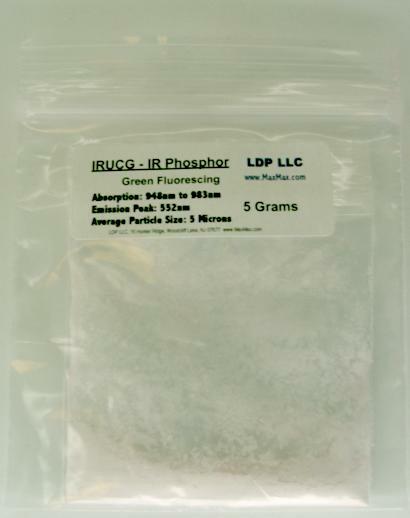 The IRSPG phosphor holds energy for a period of time and releases the energy in for form of photons when excited with a broad range of infrared light. Once the IRSPG has released the energy, the phosphor will cease to glow until it is charged up again. The IRUCG, IRUCB and IRUCR phosphors will continue emitting visible light as long as they are stimulated with an infrared light source of the correct frequency and power. Because up-conversion phosphors are an unusual, expensive and rare substance, they are a good candidate for security applications. To see the up-conversion phosphors, an special IR viewing device is required or a 940nm to 980nm laser. Caution is required if using an IR laser since the IR beam will be invisible to the human eye. Using 880nm and 940nm IR flashlights is not a good way to check for up-conversion phosphors. Even our 5-LED IR flashlights are not very useful to check for up-conversion phosphors. IR up-conversion is an inherently inefficient process because it requires multiple IR photons to get enough energy to emit a visible photon. The most efficient IR up-conversion is the IRUCG, followed by the IRUCR and IRUCB. Detecting the IRUCR and IRUCB requires an infrared laser or specialized equipment. The IRUCG-EX can also be excited in infrared laser in the 1500-1600nm range. While our 940nm IR flashlights will cause the IRUCG to fluoresce, the visible light emitted is very small and difficult to see unless you are in a very dark room. We recommend using our IRDET1 which is specially designed to detect the IRUCG by using a large bank of IR LED's and creating a shadowed window to block ambient light. A single 940nm 20mW IR LED will cause a very small green glow when held next to IRUCG powder in a dark room. Our IRDET1 uses a bank of 20 940nm IR LED's and has a shielded light design to reduce ambient light on the surface being examined.